Xela is located near a string of active volcanoes which makes it a great place to base yourself for hikes, and at 2330 M - they will literally take your breath away. There are quite a few tour companies, but Quetzaltrekkers is an amazing volunteer-based organization that leads treks to a number of the nearby volcanoes, as well as a three day hike from Xela to Lago Atitlan and a six day trek in the northern highlands from Nebaj to Todos Santos. Santiaguito is one of the world’s most active volcanoes. The tour doesn’t take you up the mountain, but to the mirador (look-out point) of Santa Maria, another steep volcano that can also be summited. In anticipation of the clouds rolling in, we left in the dark at 5 AM, drove to the base of Santa Maria, and hiked an easy 1.5 hours to the mirador. Just after our arrival, the volcano erupted. It began as a deep, loud and thundering rumble, a large, streaming cloud of black smoke emitting from the belly of the volcano. It slowly turning from black to grey as it spread out and eventually dissipated - our entire group watched in awe. A separate hike up Santa Maria takes you to a higher elevation than the mirador, and from the top especially in the full moon hike, you have an amazing ariel view of Santiaguito. 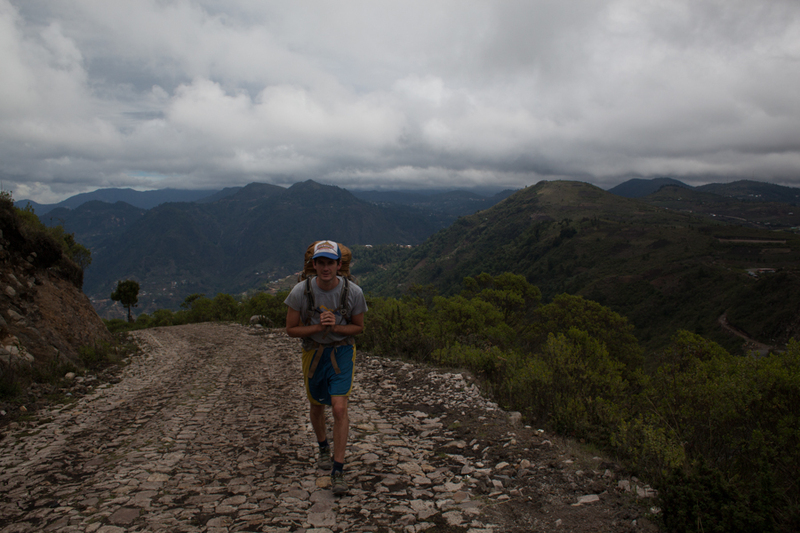 After a light nap in the sun, we leisurely made our way back to the base of Santa Maria and back to Xela. 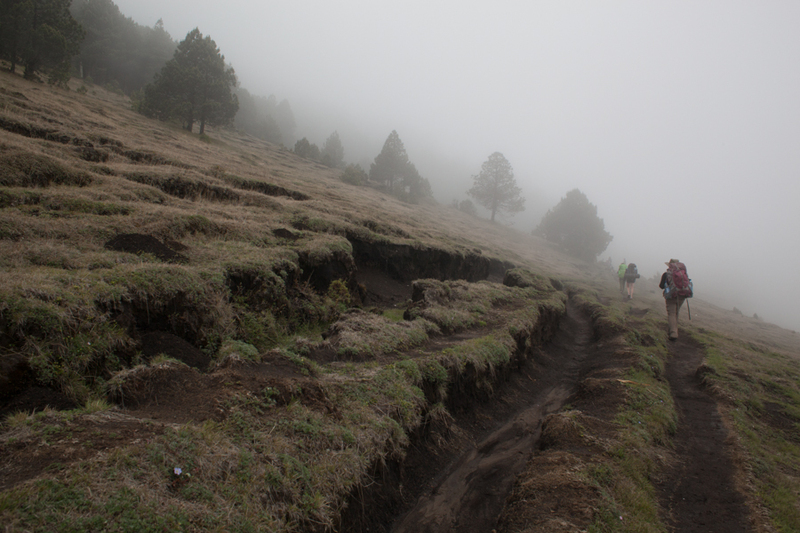 At 4220 M, Tajumulco is the highest volcano in Central America and a challenging 1.5 day hike. We left Xela at 6 AM, took the chicken bus to San Marcos, and after a hearty breakfast at a bus station comedor, slowly set off. The hike itself took about 4.5 hours, with a quick lunch stop. While the weather appeared only cloudy at the start, after 30 minutes, we were walking through thick fog. At our lunch stop, we dined on a delicious spread of cold salads, dips, and bread. While eating, we heard the low rumbling of thunder followed by a cool and strong wind. With the threat of rain, we didn’t spent too much time having lunch. Setting up your tent in the rain is nearly guarantees having a wet and uncomfortable sleep. Although the slope of the hike was not difficult, the altitude was the bigger challenge. We arrived at the campsite mid-afternoon and set up tent. 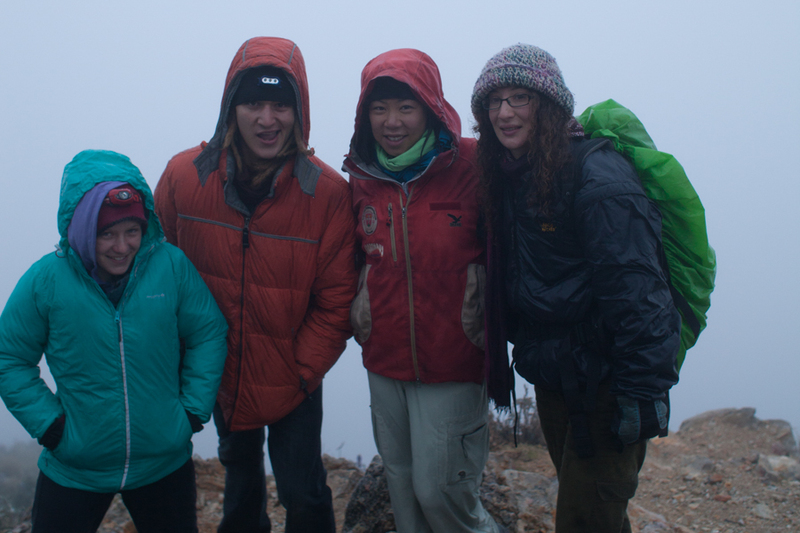 A few hikers went to the secondary summit, but with the fog, there was nothing to see. We went to bed early, hopeful that we would awake to see the sunrise. No luck. Our group of 15 headed out of the campsite at 4 AM and scrambled the last 200 metres to the summit. The path was dark and foggy, and looking back you could see the gentle sway of head lamps from hikers behind us. We arrived just before sunrise, but unfortunately, all we could see was white fog. And then it began to rain. On a clear day you can see the entire range of volcanoes, and even as far west as the Pacific Ocean. We were a bit disappointed to not see the sunrise, but we felt the overwhelming cold much more. Quickly we returned to the campsite for a hot breakfast, and took two hours to descend back to the base of the volcano. Although the weather was anything but favorable, the overall experience was still surprisingly enjoyable. A must-do during the non-rainy season!